Now I want to play PoDD Have you succeeded beat HRtP in both ways? Heaven and Hell? Emronn wrote: Now I want to play PoDD :DHave you succeeded beat HRtP in both ways? Heaven and Hell? 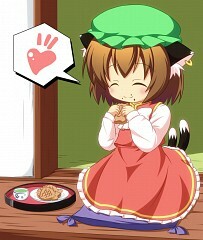 I haven't paid all that much attention to Chen. But maybe that will chenge! I discovered it back in 2005 thanks to a DVD sold with a game magazine. I found a demo version of EoSD inside and I played with it any time we were on pc at high school! At that time I think Touhou was quite unknown in the western part of the world. Now I know a lot about its music and the world of rearrangement albums but I've just played with EoSD ah ah ah (to be honest I tried also some of the earliest games once, just for some minutes though XD), so I don't know that much about history or characters. In december i was in Tokyo and I went to the Comiket to meet a Japanese friend of mine who run a label all about Touhou rearrangements with flutes and orchestral instruments (he makes amazing music by the way), and I saw tons of booths selling Touhou doujin works! Awesome! The label I was talking about is Machikado-Mapoze if you're interested. In any case, ZUN is a genius.